The Quantified Wardrobe « Adafruit Industries – Makers, hackers, artists, designers and engineers! Matt Manhattan has painstakingly documented all of his clothing purchases for the last several years and has put all the data on-line in both infographic, spreadsheet and pictorial forms. He is giving a talk this week at the Quantified Self 2017 conference in Amsterdam titled “Overthinking Everything I Own“. Matt explains his interest in tracking his clothes by color, brand, price and where they were obtained. 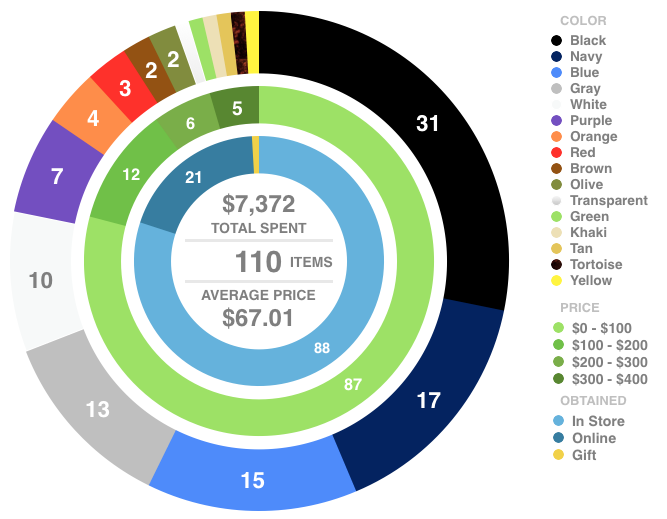 The above infographic shows all of these thing with the outer circle being the quantity of clothing items sorted by color, the middle circle is price range and the inner circle is where they were purchased. He tends to buy in store. Matt believes that by reviewing this data it will present him with additional purchasing information eg. he likes t-shirts that cost about $22, not necessarily $10 or $40. Matt also produced an interesting graph of how much he was spending monthly across several years. While this too might be good data to have I do question one thing about his tracking. My wardrobe seems to be constantly expanding and the minimalist in me would like to shrink it down. If I was willing to track my wardrobe it would be based on frequency of use. I’d like to know which clothes get the most wear so I can give away or sell off the ones that are not being used enough.